Red Couch Recipes: Tablescape: Where's the Beach? We finally have a day in the 60's! Yahoo!! Warmer weather greatly increases our dining options. We have two outdoor tables; one table is on our upstairs deck and the other is on our downstairs patio. We tend to use the upstairs deck more because it is more convenient to the kitchen. 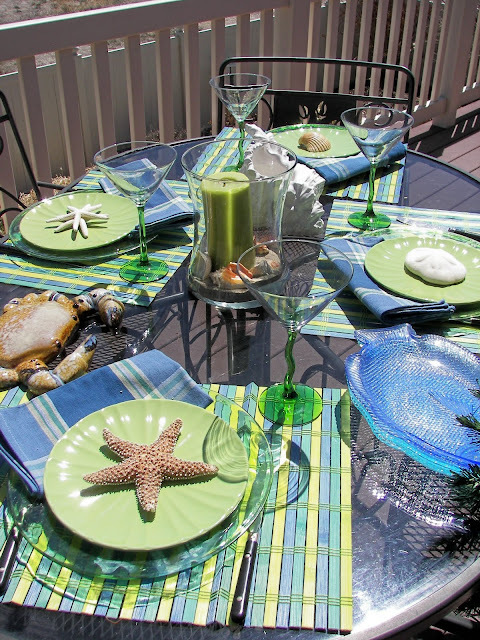 This week I have set the table on our upstairs deck in a beachy theme. I placed a shell on each plate. My girls share a room and after going to the Oregon Coast last year, they have wanted to change their room decor to beach decor. My little one (nine years old) recently spent all her allowance money at T.J. Maxx on beach decor. 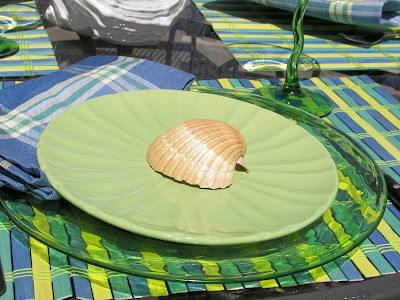 The crab, white ceramic shell, and sand dollar you see in this tablescape I borrowed from her! About two weeks ago, our T. J. Maxx had the cutest beach decor! Mr. Crabby that my daughter bought. I just threw some sand and shells in the glass container. I found the placemats on clearance at Wal-Mart this week. I love the colors blue and green. We may not have green grass or flowering bushes yet, but I think this tablecape really lights up the deck! 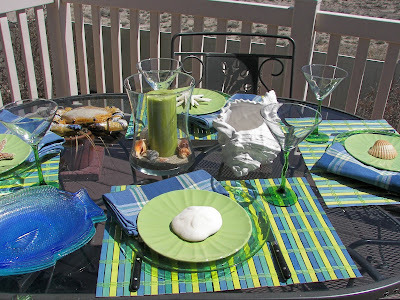 I am participating with Susan at Between Naps on the Porch for Tablescape Thursday. You can click on the logo below to view inspiring tablescapes. Makes me ready for summer and the beach. Cute table and I do love those place mats! Love the colors! 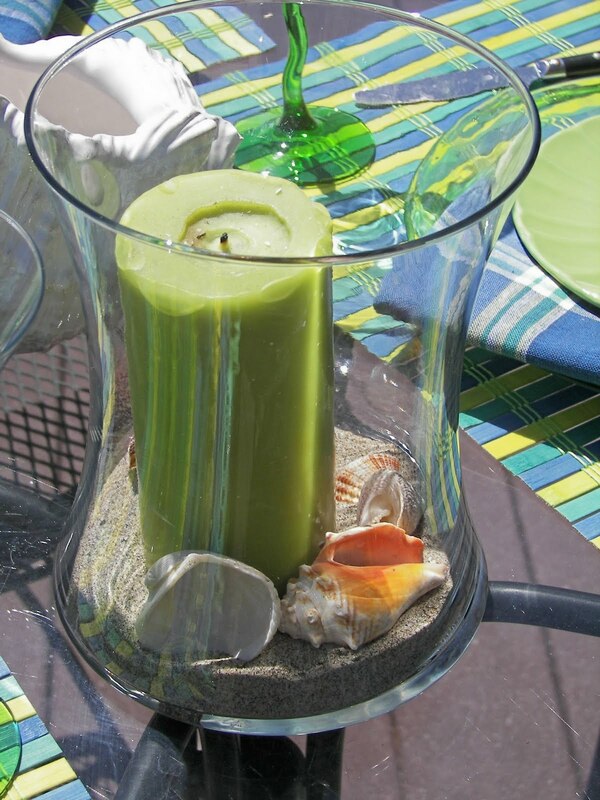 A beautiful beachy table! Love the colours and the beachy feel. I recently posted about my plans for sprucing up our patio area and I am using similar colours. Love them. I love this tablescape! Great job and all the colors! I just did a beachy tablescape only I did muted colors this time. Love the beach look! Oh, your girls are smart to want beach decor!! Where's the beach you ask..., on my blog, haha!! How great is this tablescape! I love that your children like the beach theme and you did this tablescape with that theme. 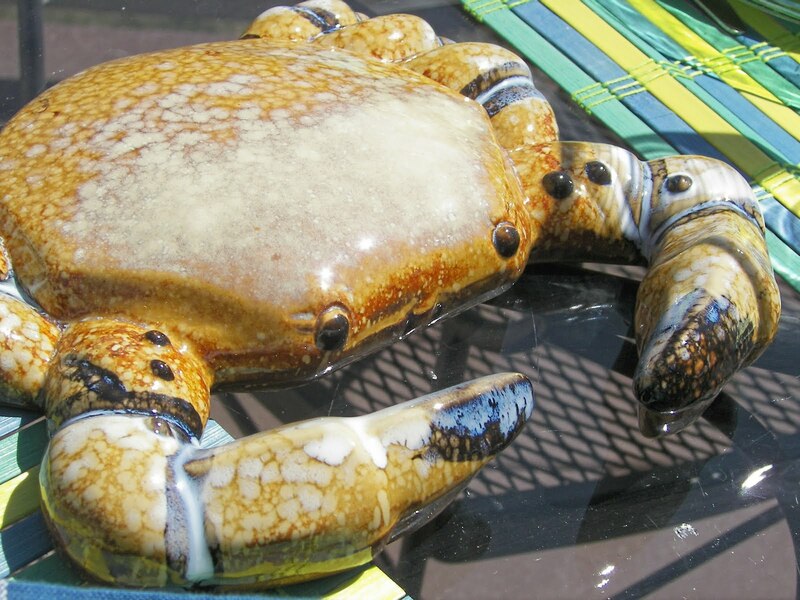 I got that same crab from TJ Maxx. Can't wait to use him on a tablescape real soon. You have made me want to go to the beach. Joni, I love your table!!! It puts one in the mood for summer. The greens and blues are pretty and love the crab! Great job! That's one way of bringing summer in even before mother nature does her part! If the girls are already decorating with their allowances, you may have a long road ahead :) Loved the colors! Happy that it's warming up for you:) Your beachy tablescape is sooooo CUTE! I’m having a GIVEAWAY…come by and enter…I think you will like it! That is so cute. I think it is sweet you dd wanted to buy beachy things..I love blue and green together too! This is very colorful and warm! Love it when we can eat outside! Love the beach theme - I'm jealous of your outdoor tables! It's also wonderful that your daughter shares with you! :) Thanks for your comment on my blog as well! Happy Spring! Very cute. Great casual dinner "out". Thanks for sharing, makes me want to decorate a beach table too, but I better wait. Long hot summer coming--I hope. Love all your beach-y touches -- and how fun that your little one supplied some of the fun elements of your table! LOVE that glass-topped table for outdoor dining. Such a nice beach party. I love it. I love your blue and green beach themed tablescape...it is so cute that your daughter bought some of the table accessories. Your idea of using shells in the candle and on the plates is really attractive. Nice 'scape. -- Jane F.
This is so cute, Joni! I love a beach theme anywhere!! I have to hit TJ Maxx for some of the sea creatures!! Love everything...so bright and cheery. Nicely done!! Love your beach theme and the blue and green color combination is so freah and pretty. 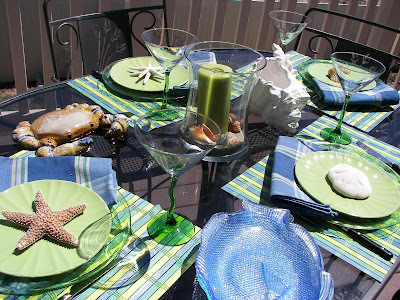 Great Beach Tablescape...love the bright colors and the crab is awesome. You had me from the title -- Where's the Beach!! Very clever. And very lovely table setting. I love your beachy theme! 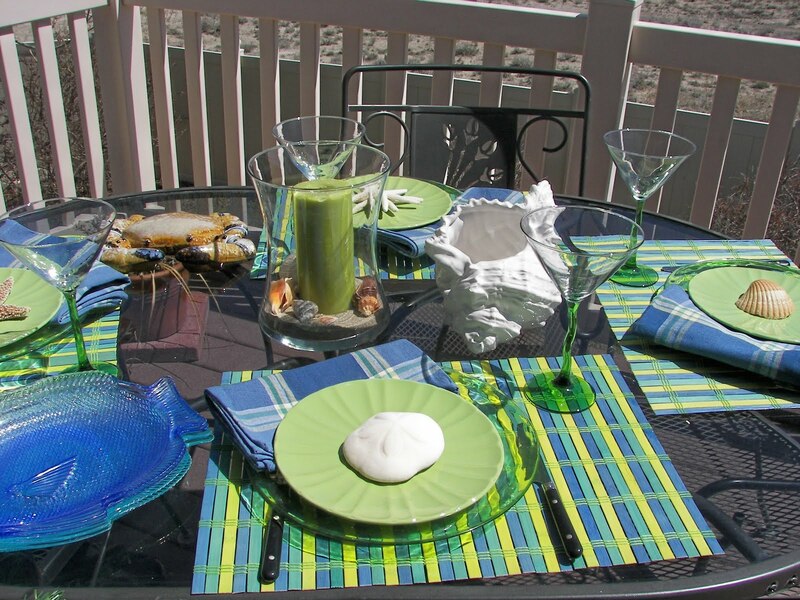 All the colors and dishes, so perfect for a table outside.